These impressive homes from the Dwell community deserve a standing ovation. Our editor's top picks of the week feature homes that embody thoughtful modern design. From the architect: "Acting as a home base during the work week, this 16th floor minimalist pied-a-terre is anchored by bridge and mountain views. 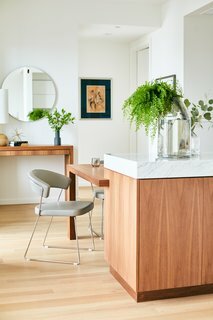 Custom Oregon walnut millwork and casework bring warmth to the simple shell while white carrara marble adds textural luxury." From the project uploader: "Casa Luum lies at the end of an old dirt road in a nature reserve in Faro, its milky whites blending smoothly into the progressive blue of the sky. This 2500 square meter plot once housed a ruin left to nature, where hundreds of olive, almond, and cork trees and wildflowers grew. Designed by internationally renowned Portuguese architect Pedro Domingos, this modern installation employs a fresh, selective approach to minimalism and simplicity. The bleached structures form a series of interrelated living areas following the fundamental principles of contemporary Alentejano architecture." 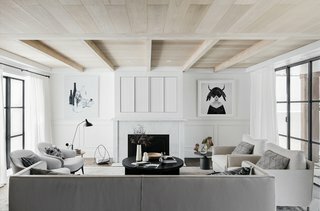 From the architect: "Palm Beach House is the transformation of an existing waterfront holiday villa. The project is a restrained approach to a traditional European vernacular, exploring bespoke quality detailing, materiality and architectural framing. With the existing house ineffectively dealing with scale limitations, the brief was primarily to explore how we could reintroduce a higher quality of spatial resolution. 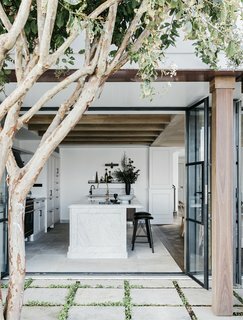 With an emphasis placed on architectural framing and the suitable transition from interior to exterior ... the large-scale opening explored opportunity for external living and dining, an integral aspect to the client brief addressing the need for entertaining spaces, essential for a ‘home away from home’." From the project uploader: "Flanders Art Suite is a seamless habitat that explores the boundaries between exhibition and lifestyle. 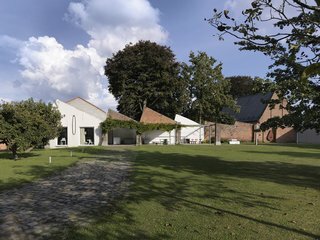 Creating environments for their own work and established artists, the home serves as the ultimate canvas that recreates the holiday experience as a living gallery of arts and crafts.Situated on the site of a formerly derelict shipyard, the cluster of buildings is a living canvas dedicated to the collaborative arts of interior design and artistic innovation. The project presents rotating installations in partnership with artists and industrial designers in an intimate and livable space." 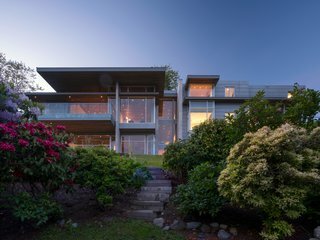 From the architect: "Situated on the edge of a bluff above Semiahmoo Bay, the house creates privacy while taking advantage of spectacular views of the water, islands and mountains to the west, east and south. Thick concrete walls shield the occupants from sights and sounds of the busy road above. Glass window walls and expansive decks maximize the south facing side. The cascading layers of the house are connected by a cast-in-place concrete stair. The stair opens to a gallery on each level with views out to the Bay below."